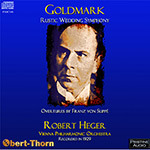 The present transfer of Goldmark's Rustic Wedding Symphony was taken from mid-1930s American Victor "Red Seal Scroll" label shellacs in album M-1 03 made from "Z" pressing-like material, providing the most quiet surfaces on which this recording was issued. Two matrices (the third side of the first movement, and the one side which comprises the entire second movement) were only ever issued in sonically-compromised dubbings, and a change is sound quality is unavoidably noticeable here. The sources for the two Suppé overtures were late 1930s Victor pressings – a "Gold" label pressing for Pique Dame (Victor 11346) and a scarce late Black label pressing for Morning, Noon and Night in Viennal (Victor 36004). Neither the latter overture nor the Goldmark have ever been reissued on LP or CD before, and this release marks their first extended-play appearance.